We just went hands-on with Samsung's first Android Wear, the Gear Live. It was lovely and very promising. But then we just got to strap Motorola's Moto 360 on, and oh man, it's gorgeous. GORGEOUS. Here are our quick first impressions. The first round-faced Android Wear is just great-looking. Samsung's is by no means ugly, but it still looks very much like a digital smartwatch type thing. 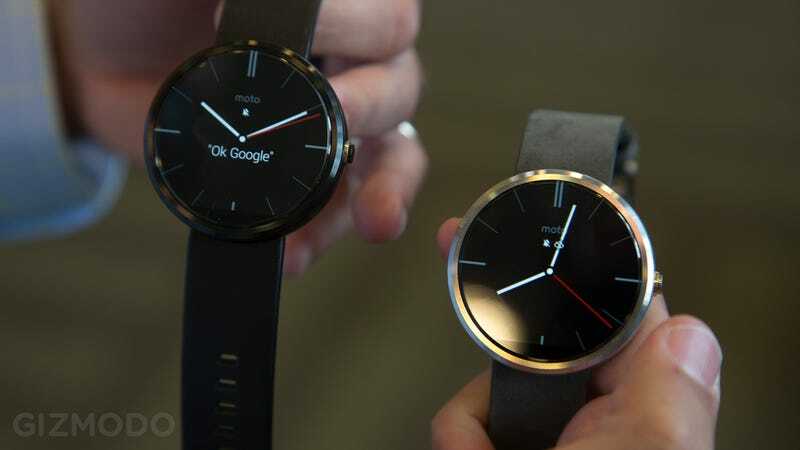 The Moto 360 just looks like a watch. It's a little bit on the thick side, but it was light and comfortable to wear. I tried on soft leather straps in black and grey, and not only were they comfortable, but they felt much more secure than Samsung's clasp. Here's an interesting tidbit: Motorola refused to let anybody look at the back of the watch. I managed to catch a tiny glimpse, and it wasn't just metal. There was a perforation there. Does that mean there's a heart rate sensor? We really, really hope so, but it's something Motorola is being very tight-lipped about. Fingers crossed. As with Samsung's Gear Live, I was mostly relegated to using the Moto 360 in its demo mode, though I did get to play with a non-demo version for a quick moment. Swiping around the UI (up/down to change cards, right/left to dive deeper into them) was super fast and smooth. By default, the screen is off, but when you raise your wrist in the standard check-the-time gesture, the screen lights up. Hopefully that will result in some battery-saving. Unlike Samsung, Motorola refused to give us projected battery life, but they implied that it would be "very good," whatever that may mean. The screen looked very nice and was easy to read. We're assuming that it too was an AMOLED screen because the blacks were super-deep, and that would make sense for power-savings. Again, we weren't allowed to do much exploring (on the non-demo version they wouldn't let us look at the settings, for some reason), but from what we saw we were very impressed. It's nice to have confirmation that Android Wear looks good in both square and round styles, and it made us even more eager to spend some real time with the finished unit when it's released "sometime this summer." Hopefully the price—the biggest open question— will be as appealing as the looks.